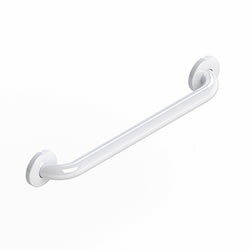 ADA grab bars available in white powder coat or knurled, various lengths. Quantity savings available. Length: 12" 18" 24" 32" 36"
HealthCraft Products Easy Mount Grab Bars have 9-holes, which means greater versatility during installation. The extra holes provide mounting options for angled grab bar installations, and for areas where stud spacing may vary from 16” centers. It is easy to add an additional mounting screw for peace of mind. Flange covers conceal the screws for a simple and modern finish. Bar Lengths: 12", 18”, 24”, 32”, 36”, 42"
Easy Mount™ Flange. Unlike 3-hole flanges that limit screw placement, an innovative 9-hole flange allows a grab bar to be installed at varying degrees. Easy Mount™ provides the option to insert additional screws if required. Will Never Rust. Chrome plated grab bars can chip, rust and stain tile over time. Easy Mount™ bars are made of stainless steel and will never rust, ensuring a lifetime of worry free service. Concealed Screws. Flange covers conceal the screws for an attractive finish. Can't Find A Stud? Also compatible with specialized grab bar fasteners and anchors that mount directly behind drywall, tile and other surfaces should stud spacing not permit direct mounting, see below. Note: Rail length measurements are from centre of the flange plate. Maximum user weight / load for grab bars is dependent on selection of appropriate mounting hardware for mounting surface. The manufacturer has supplied mounting hardware for basic installs into wooden studs. The manufacturer recommends grab bar installation by a qualified contractor. All rail diameters (1.25" and 1.50") and wall clearance of rail (1.5") are ADA Compliant.